Your visit to Thonga Beach Lodge in KwaZulu-Natal, South Africa, will be on the Maputuland coast, where water activities are magnificent. 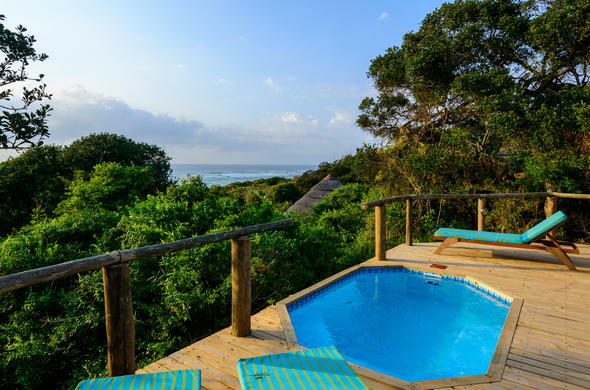 A short 25 minute drive from Southern Africa's largest freshwater lake, Lake Sibaya, this KwaZulu-Natal beach lodge consists of 24 beds located in raised thatched suites that are spread out in the coastal dune forest and along the coast. Days can be spent lounging by the swimming pool with a cocktail. Evenings can be spent by the fireplace in the lounge area or out on a romantic candlelit dinner date on the shores of the Indian Ocean. Activities take advantage of the prime location of this KwaZulu-Natal beach lodge and include snorkeling and scuba diving in the warm Indian Ocean. Visit the nearby Lake Sibaya for exciting bird watching excursions, fish on the shores of Maputuland and visit a local Tsonga homestead for a dose of South African culture.